Coupons.com Charging for Their Coupons? Hmmm. Coupons are free, right? All over the Internet, you can find printable coupons galore, and all it really costs you is your time, paper, and a little ink. (Of course, if you recycle using the back of paper you no longer need, then that is free too! Learn more Coupon Printing Tips HERE.) Coupons are offered by manufacturers and grocery stores free of charge. Even the really good, high-value coupons that might not come along as often are still offered for free. But that looks like it’s about to change. Right now, you can get a 30-day trial of these premium coupons for free, however, when you log in, you must still hand over your credit card info and decide if you want the one-year subscription for $30 or a month-to-month subscription for $3/month. I’ve heard that you get to print more than the usual print limit of 2, but I don’t know if that’s true or not because I haven’t joined the club yet. If “early access” means that you are notified of the coupons earlier than everyone else, so you will actually be able to click on the ones you want and they will still be there instead of having reached their print limit, that might be nice. I pay for my Sunday newspaper, and I don’t have a problem with that. So will I join this club? Not sure. 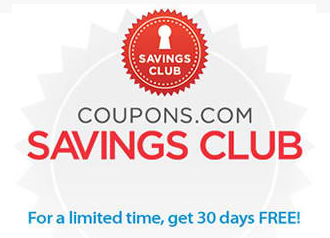 Tell me what you think about the new Coupons.com Savings Club. Will you join? Should we have to pay more for “premium” coupons? Double Coupons Possible at Walmart? Probably not. When I buy the sunday paper, I have a preview of the coupons before I purchase the paper. This way I know whether or not it is worth it to buy a paper! I’m not impressed with the list of Premium coupons from coupons.com, and probably will not participate. I use coupons to save money. I am certainly not going to pay to print coupons on my own paper at home! Me neither! Love the free printables. I don’t think I will subscribe. The coupons are preselected. If I had a subscription to a coupon site I would like to chose what coupons I want. I get two newspapers and the All You magazine. Sometimes I wonder if I should continue my subscription to All You because I don’t use most of the coupons but the articals are informative and encouraging. I get Kroger coupons in the mail and Kroger has digital coupons. Publix has flyers with coupons. There are many websites that let you pick and print out the coupons you want. I subscribed to it when it came out…At the time, I was only able to print 1 copy. So far, I’m really disappointed in the choices of the “premium” coupons they have. More than likely I will cancel within the next week. I subscribed for the free subscription. I’m pretty sure I won’t be paying for it. Many of the exclusive coupons don’t seem that great to me, and some of them can be found elsewhere. For example they had $1.50 of seattle’s best 4pks, which I printed, then found that they were available on facebook. That’s the only coupon I’ve seen that I was even interested in. I’ve been signed up for like two weeks already. So if I redeemed those coupons, that’s my $3, but if that’s it, and I can’t be sure of what they would even have everyweek, I’m not sure this program is going to make it. I won’t be subscribing. I already get plenty of free coupons. What a rip-off, IMO! I print my coupons.com Qs thru Swagbucks and actually get 10 swagbucks for every coupon I use – that’s more than 10c when converted to Amazon gift cards! Coupons.com is making money from us using those coupons, they surely shouldn’t charge people to use their service! I was appalled when I saw this. Why? Because as many commented that we pay for the newspapers. No problem we know what we are getting. Sadly I think because coupons.com is a big part of the printable coupon websites that this is going to be the new up and coming fad. Making this a market. I know we are all out there to save money, but honestly I think it is ridiculous and makes me annoyed to think of things to come.